A person once stigmatized as an enemy of Pakistan, has something important to say in the contemporary public discourse in the second Islamic country in the world. 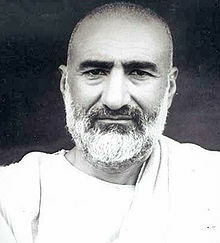 His name is Abdul Ghaffar Khan (in the picture), a Pakhtun patriot, social reformer, charismatic leader. He was a lifelong activist in favour of his fellows Pathans living North and South the frontier Durand Line. He became a very close friend of the Mahatma and he himself was called the “Frontier Gandhi”. He was born on 1890 in Utmanzai, a town in Charsadda District, in the North-West Frontier Province, today Khyber Pakhtunkhwa Province in Pakistan. He was an apostle of nonviolence, that he considered a form of spiritual jihad for his time and for the future of his people. He founded a nonviolent movement which arrived to count 100,000 members. As he wrote in his 1969 autobiography, “My life and struggle”, “in 1929 we were able to found the kind of organisation we wanted. We decided to call it the Khudai Khidmatgar movement (Servants of God movement). Our motive for choosing that name was that we wanted to awaken in the Pathans the idea of service and the desire to serve their country and their people in the name of God, an idea and a desire which was sadly lacking among them”. The Khudai Khidmatgars were also known, for the color of their uniforms, “Red Shirts”. The founder was called by his followers, as a mark of esteem, Badshah Khan, also spelled Baacha Khan, or more commonly Bacha Khan, that means “king of our nobles”. Baacha Khan fostered free education for all, women rights, religious freedom, judicial reform. He also was a pioneer of ecology and sustainable development. He believed in self-government for both the settled and the tribal Pakhtuns. He strongly opposed the Partition of India, proposing autonomous provinces in a unified Indian federal framework. When the Partition became inevitable, he renounce to oppose it with riots or violence. He and his Khidmatgars accepted, reluctantly, Pakistan as their new country and decided to be loyal. They hoped the new regime would have given the Pakhtuns a chance to live united in their territory, free to self-govern their own province. The autonomy of the federal units in Pakistan was instead nipped in the bud and their movement was declared illegal. For the freedom fighter, a new cycle of imprisonment started. Baacha Khan spent one-third of his life in prison, but, more precisely, he spent more time, about 15 years, in Pakistani prisons than he had spent in the prisons of the British Raj, “only” 12. He also went in exile in Afghanistan, where he supported local Pashtun cultural, social and economical development, fighting backwardness, clanism, family feuds. He gave in Afghanistan many speeches in favor of “Pakhtunistan”, which were free of every kind of chauvinism, fostering freedom and self-government of his people, within the Pakistani federation, firmly anchored to a commitment for peace in all South Asia, all over the world. “I am looking forward to the time when free, general elections will be possible again in Pakistan. – he wrote in his 1969’s autobiography – For only then will the world know which way my people are going and whom do they follow. This is the main conflict between me and the rulers of Pakistan.”. This champion of Pakhtun patriotism remained unheeded. He won’t see general and local fair election either under the dictatorship of Ayub Khan, nor under Yahya Khan, nor under the civil but still authoritarian rule of Zulfiqar Ali Bhutto, nor under Zia Ul-Haq. He couldn’t see the general elections of December 1988, when Benazir Bhutto, daughter of Zulfiqar Ali, became Prime Minister, for he died in Peshawar on January 20. He had requested to be buried in Jalalabad, Afghanistan. He hoped this way to witness the need of friendship, and mutual understanding, among all Pakhtuns, between Afghanistan and Pakistan. His last wish succeeded in leaving a footprint in the heart of many throughout South Asia. As one can read in Rajmohan Gandhi’s biography of Bacha Khan (New Delhi, 2004) his funeral resulted a mammoth rally: “Though the Afghan struggle was not yet over, the Kabul government and the mujahedin both announced a ceasefire for the event. Tens of thousands of the Frontier’s mourning Pakhtuns accompanied the coffin and crossed the Durand Line. Pakistan’s military ruler, Zia-ul Haq (who would be killed in a plane crash later in the year), and India’s Prime Minister, Rajiv Gandhi (also destined for a violent death), were present for the last rites.” (see Gandhi R., Ghaffar Khan, 2004, p. 263). After decades of oblivion, his political heritage are now again gaining momentum among Pakhtuns. An important political player in the re-established Pakistani democracy, the Awami National Party (ANP), wrote in its manifesto that it “draws its inspiration from the example and teachings of Khan Abdul Ghaffar Khan, affectionately known to his people as Baacha Khan. He spent his entire life in the struggle for freedom and justice. He and his Khudai Khidmatgars offered great sacrifices in the fight against colonialism, imperialism and all other forms of oppression. In a broader sense, Baacha Khan saw politics as the highest form of public service and often described himself as only a social worker. His objective was to liberate the masses of South Asia and, particularly, his own people, the Pakhtuns, from the shackles of ignorance and poverty, so that they could rise to their full potential.” (cf http://awaminationalparty.org/). The ANP was led in the past by Bacha Khan’s son, Abdul Wali Khan, and today the most prominent figure is his grandson, Asfandyar Wali Khan. In the 2008 elections, the Awami National Party won the majority in Khyber Pakhtunkhwa and elected its first Chief Minister since the independence, in coalition with the Pakistan People’s Party. ANP is allied with PPP also in other provinces and at the federal level. The parable of the Taliban regime and the political violence that still sets fire through the area, has been a terrifying experience for everybody but especially for Pakhtuns. Baacha Khan is being rediscovered, as a source of inspiration for a better future. 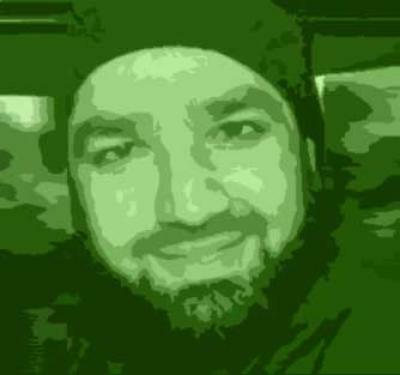 He was a devout Muslim believer, but he refused terror and was also alien from any bigotry. His political action was centered on peace and social reformation. He sacrificed as a satyagrahi in nonviolent campaign of civil disobedience, firstly against the British Raj, but later also against Pakistan authoritarianism and military rule. His spiritual heritage helped ANP to defeat the Muttahida Majlis-e-Amal, the Islamist coalition, which was in power in Pakhtunkhwa before 2008. It was a highly symbolic victory. In the name of Baacha Khan, the modern ANP defeated the Islamists, as well as the ancient Khudai Khidmatgars had always defeated the Muslim League in both the elections hold in the province, under the British rule, on 1936 and 1946. Many hope that this political change could represent the end of a cycle, dominated by a tangle of Islamist and nationalist ideologies, which have painfully marked the history of the Frontier, of all Pakistan, Afghanistan. Several notable cultural foundations and charities are working in South Asia to promote peace and human rights through the rediscover of Badshah Khan’s life, thought and action. We must nominate the Baacha Khan Trust (see http://www.baachakhantrust.org/), whose chief aim is propagation of Ghaffar Khan’s philosophy, his vision of renaissance for the oppressed and marginalized Pakhtuns communities, and for peace in Pakistan, Afghanistan, the whole South Asia. Nowadays efforts to make the public opinion and new generations aware of the figure and the teachings of Baacha Khan would certainly help the stabilization of the so called Afpak area. After 60 years of political authoritarianism and violence in Pakistan and 40 years of civil war in Afghanistan, it’s probably time to know something more about Bacha Khan. His Red Shirts were able to provide “local leadership for education and development, and stood up for the dignity and rights of their community. 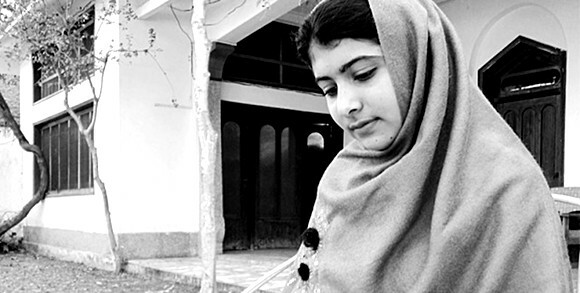 They balanced affirmations of the rights and dignity of all people with teachings about responsibility and sacrifices needed to serve those same communities.” – Ali Gohar, founder and guide at the Just Peace International center, in Peshawar, recently wrote, adding that the beauty of this kind of nonviolent struggle is again alive in 2011 Arab Spring heroes cf http://www.khyberwatch.com/index.php?mod=article&cat=MediaWatch&article=391). “You all know that I believe in the principles of non•violence. – he said on August 31, 1966, talking in Afghanistan on the Pakhtunistan Day, as reported in his 1969’s autobiography – I am convinced that there will be no peace in the world till the problem of the Pakhtuns has been solved. I am telling both the Russians and the Americans the same thing: if they really want peace, they should solve the problem of the Pakhtuns. What do we want? We keep on telling Pakistan to consider us their brothers and not to make us their slaves. We were never the slaves of the British and you should not expect us to be your slaves.”. Heared today, these words are somehow prophetic and should encourage a serious reflection. The Pathans, both in Afghanistan and in Pakistan, still need an accountable local self-government, in order to take on full responsibility of their own territories. They can hardly be governed from Kabul, or from Islamabad. May be they can resolve their own way their problems, included terror-related and security’s ones. The recent Pakistani devolution can be seen as a historical accomplishment on the way indicated by Baacha Khan. This is what many political leaders, not only ANP’s ones, strongly believe. Federalism was part of the independence struggle and the only way to make the idea of Pakistan into a lasting reality. Unfortunately, the centralized, bigoted and corrupt, republic chosen by Afghani Pashtun leadership, after the fall of the Taliban regime, is much farer from Baacha Khan’s ideal of decentralized responsible and accountable self-government. The present solution resembles too much like the 1973 republic. It may be not reveal the right solution for the future of such a vast, diverse, and bitterly divided, country. Abdul Ghaffar Khan, along all his existence, advocated for reforms, social justice, change through education, and, last but not least, peaceful coexistence of all communities, without any kind of ethnic, religious, caste, clan, social discrimination. He strongly demanded his fellow Pakhtuns, to strive against ignorance, bigotry, prejudices, family feud and political violence. His message, which follows the furrow of modern nonviolent revolutions, which have already brought down more than an empire, can drive the Islamist factions and wider Muslim public opinion to a radical rethinking. His teaching was prescient and it is today more relevant than ever: “And you, misguided Pathans, you do not even stop to think whether this is Islam or not, you just swallow anything you are told… I want you to promise me that you will never let anybody deceive you in the name of Islam.” (from Baacha Khan’s speech in Afghanistan, on Pakhtunistan Day, 31 August 1967, as reported in Baacha Khan’s autobiography, 1969). Plans are afoot to build the world’s first ever international Sufi university near Bhit Shah in Sindh. The main purpose of the institution would be to promote interfaith and intercultural education to tackle extremism in the country. Such a thought and project could only have come about in Sindh. Especially in the context of what Pakistan has beengoing through in the last many years. Not only have the country’s other provinces – especially the Punjab and Khyber Pakhtunkhwa (KP) – become central targets of horrid terrorist attacks by extremist organisations, the Punjab in particular has also been witnessing a steady growth of faith-based conservatism within its urban middle and lower middle-classes. When extremists (calling themselves ‘Punjabi Taliban’) attacked the famous Sufi shrine, Data Darbar in Lahore late last year, economist and political analyst, Asad Sayeed, made a rather insightful observation. He said that had such an attack on the Darbar taken place twenty years ago, thousands of Lahorites would have poured out to protest. But not anymore. The attack on one of Punjab’s most popular Sufi shrines was simply treated as just another terrorist attack. Journalist and intellectual Khaled Ahmed once wrote a telling tongue-in-cheek article about the annual gathering of the Dawat-i-Islami in Multan. Ahmed wrote how after Dawat’s huge congregation in Multan, when police found some bullet-riddled bodies of Dawat members, the outfit’s main leadership simply refused to acknowledge the glaring evidence that pointed towards the involvement of an opposing Sunni sect’s organisation in the murders. Ahmed adds that Dawat leaders began babbling about ‘outside forces (RAW, CIA, Mossad)’ who wanted to create disharmony between Pakistan’s Barelvi majority and the Deobandi and Wahabi sects. One can understand the above-mentioned episode as an example of the confusion Barelvi spiritual leadership has gone through since the 1980s. From its inception in the 18th century and until about the mid-1980s, the Barelvi sect was largely apolitical in orientation, non-Jihadist and followers of some of the most relaxed dictates of the Hanafi madhab – the first of the four main Islamic schools of law that is also considered to be the most moderate. ‘Barelvi Islam’ (as it is sometimes called) is purely a sub-continental phenomenon that fuses elements of Indian Sufism with the folk and populist strains of various cultures that exist in the sub-continent. It is also called the ‘folk Islam’ of the region in which a high degree of tolerance exists between various faiths, sects, classes and ethnicities and in which the puritanical aspects of other Islamic sects are eschewed and even rejected. 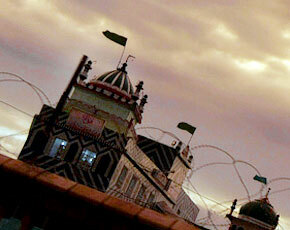 The Sufi shrine and an intense reverence of the Prophet (PBUH) play a central role in Barelvi Islam. Its populist and moderate make-up helped it become the majority Sunni sect amongst the Muslims of the sub-continent. Two of its leading opponents have been the Sunni Deobandi sect (also a product of the subcontinent) and the Saudi-inspired Wahabism. In spite of being the majority sect amongst Sunni Muslims in Pakistan, ‘Barelvi Islam’ hardly ever had a coherent political expression in shape of a mass-based political party or organisation. Its spiritual leadership remained pro-Jinnah (unlike Deobandi organizations of undivided India), and various Pakistani political leaders have continued to appeal to the symbolism and lingo associated with various populist aspects of Barelvi-ism. Zulfikar Ali Bhutto and his Pakistan Peoples Party (PPP) was the most successful in this respect. Bhutto was also one of the first leading Pakistani political figures to undertake the act of regularly visiting various famous Sufi shrines in Sindh and Punjab. Barelvis are in the majority in Sindh and the Punjab, whereas Deobandis are largely centred in Khyber Pakthunkhwa and in the Pushtun-dominated areas of Balochistan. Until the 1970s Barelvi-ism also prevailed among many of Sindh and Punjab’s urban middle-classes, especially those who considered themselves to be progressive and likely supporters of secular politics. However, the arrangement in this context was suddenly disturbed with the arrival of the Ziaul Haq dictatorship in 1977. Dipped in the political Islam of scholar and Jamat-i-Islami (JI) chief Abul Ala Mauddudi, Zia soon moved towards infiltrating the spiritual and political nerve centres of Barelvi-ism in an attempt to ‘reform’ them. Barelvi dominance across the country’s religious landscape reminded him of Z A. Bhutto’s populism (which he, like JI, considered to be ‘vulgar’ and ‘un-Islamic’), and from 1979 onwards Pakistan under Zia also became one of the leading client states of Saudi-generated Wahabi propaganda and aid. Stunned by the ‘Islamic revolution’ in the Shia-dominated Iran in 1979, Saudi Arabian monarchy and its Wahabi Sunni religious elite began seeing Pakistan’s Barelvi-dominated make-up as venerable to Shia-ism’s revolutionary symbolism and also of socialist propaganda, especially with the arrival of Soviet forces in Afghanistan. At least that was one of the reasons used by Zia and his Saudi allies to draw the United States into giving Pakistan billions of dollars worth of aid and arms. With the aid also came Wahabi propaganda literature and preachers who along with Pakistani Deobandi and Wahabi spiritual and political groups began setting up madressas and mosques. These madressas operated as institutions that would indoctrinate young Pakistanis – most of whom were immersed in the non-Jihadi traditions of Barelvi-ism – and prepare them for Jihad against Soviet forces in Afghanistan. Bralevi tradition had also not been very kind to the ulema and the clergy. To address this, Zia also began describing famous Sufi saints as ulema and banned (in the media) all criticism and humour aimed at the clergy. The Afghan war, Saudi propaganda, the mushrooming of Deobandi and Wahabi madressas and televangelists, and a concentrated campaign by the Zia regime to equate the dictatorship’s capitalist-Islamist makeup as something in accordance with the Shariah and with ‘Jinnah and Iqbal’s vision,’ had a telling impact on Pakistan’s religious sociology. In the Khyber-Pakhtunkhwa many moderate and progressive Deobandi strains that had prevailed in the province began sliding into the sect’s more radical dictates, coming closer to the puritanical Wahabi and Salafi ideas about faith. This slide was celebrated by the Punjab-dominated military as a successful blow to the secular and ‘treacherous’ Pukhtun separatist tendencies. 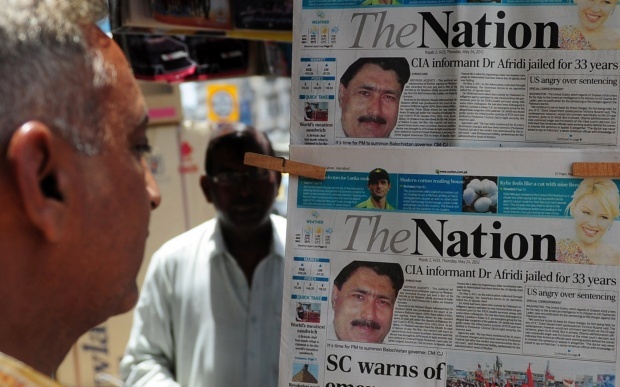 In the Punjab, the province benefited the most from Zia’s Punjab-centric capitalist maneuvers. This coupled with unprecedented remittances coming from Pakistanis who had begun going to Arab Gulf states to work from the 1970s onwards, gave birth to new moneyed classes. Many from the petty-bourgeoisie and bourgeoisie sections began moving away from their Barelvi heritage and towards more puritanical strains of faith. Their Barelvi past now reminded them of their lower status and economic modesty, whereas they began relating their enhanced economic standing with the adoption of the more puritanical strains of Islam. That’s why the growth of puritanical Islamist and sectarian organizations that Punjab saw under Zia, a lot of their local funding came from Punjab’s nouveau-riche and petty-bourgeois trader classes. Interestingly, it was also the same classes that also pushed the Barelvi leadership to become more conservative and radical. Those sections of the Punjabi petty-bourgeoisie that stuck to Barelvi-ism encouraged their spiritual leadership to compete with the Puritanism and radicalism of the growing number of Deobandi and Wahabi groups. This trend saw the first ever emergence of radical Barelvi groups. In the early 1980s, the Dawat-i-Islami was formed to counterbalance the growth of the Deobandi Tableeghi Jamaat that had begun making deep inroads into Punjab’s bourgeoisie and the military. The Dawat discouraged the Barelvis from indulging in antics associated with the region’s folk Islam, emphasising an increased reverence of holy personalities and encouraging holding of recitals of naats and milads instead of quwalis and dhamals. The last two became associated with the practices of the lower-class Barelvis. In 1992, emerged the Sunni Thereek (ST). A Barelvi outfit that emerged from the splintering of the oldest Barelvi Islamic political party, the Jamiat Ulema Pakistan (JUP). Such occurrences did not really help the Barelvi sect defend its traditions in the face of the state-sponsored Deobandi and Wahabi onslaught – rather, these organisations began turning Barelvi-ism into an equally anti-pluralistic and militant political phenomenon. By the 1990s, Zia’s manoeuvres and Saudi involvement in reshaping Pakistan’s religious tradition had seen Khyber Pakhtunkhwa and Punjab become hostage to various violent Deobandi/Wahabi outfits and new-born Barelvi reactionary-ism. The Punjab also saw a rise in the use of reactionary political and religious narratives within its lower-middle and middle-classes, whereas in Balochistan attempts were being made (by intelligence agencies) to neutralize secular Baloch nationalist militancy with the help of puritanical evangelical outfits. The agencies had already done this successfullyin Khyber Pakhtunkhwa in the 1980s. But what happened in Sindh? Barelvi-ism in Sindh (outside Karachi) has always been a lot more secular and pluralistic than the Bareilvi-ism in the Punjab. Its sociology in Sindh heavily revolves around the staunchly secular historicity that the province’s famous scholar, GM Syed’s literary work generated. He described a highly pluralistic and secular reading of Sufism as being the cultural and religious make-up of the Sindhis and it is this narrative that still rules the roost in the province’s social and religious psyche. This is one of the reasons why Zia completely failed to impose his version of Islam here. Also, just like the majority of the Baloch who equate puritanical Islam with the ‘Punjabi civil-military elite,’ so does the socio-political discourse in Sindh. On the other hand, in Karachi, though Zia-backed Deobandi and Wahabi radical outfits did manage to find a foothold, two things have always worked against these outfits here. The first is the fact that the sprawling ethnic, sectarian and religious diversity found in Karachi actually absorbs and neutralizes any attempt by an outfit to impose its version of Islam. Secondly, MQM, a party that first emerged as a mohajir nationalist group, adopted almost the same populist Barelvi symbolism and lingo as Bhutto did in the 1970s. Also, the other two big political parties in the city too are secular: the PPP and ANP. Though the Sunni Thereek (ST) has managed to infiltrate some sections of MQM’s support, ST is Barelvi and anti-Taliban (albeit reactionary). In spite of the rampant crime and ethnic tensions that are a constant in Karachi, it will not be an overstatement to claim that Karachi along with the rest of Sindh today stands to be perhaps the only (ragged) sanctuaries in present-day Pakistan that are (comparatively-speaking) largely free of the factors that have created opportunities in the Punjab and KP for violent extremist activity as well as for reactionary conservatism to now become a mainstay in Punjab’s bourgeois psyche. A fragile peace is taking root in Pakistan’s western Kurram tribal region after nearly four years of sectarian warfare between Shi’ite and Sunni Muslims. Some have criticized a recent peace pact by saying that it is less about forging a lasting peace than about facilitating insurgents’ infiltration into neighboring Afghanistan. But the local population appears committed to making it work. Success could have far-reaching implications. If peace is possible in a hotbed like Kurram, then it could serve as a model for millions suffering from war in other tribal areas. Resident Noor Janan’s situation is typical. He lost his budding business in 2007 when clashes broke out between Shi’a and Sunnis in Parachinar. Rioting in the small border city, which serves as the headquarters of Kurram, soon devolved into sectarian war. As the Sunni population of Parachinar was forced out, the city’s mostly Shi’a population was hemmed in — trapped by retreating Sunnis who blocked the main road to the outside and set siege on the city. Janan’s priorities changed remarkably. For the past four years his main obligation has not been to look after his wife and four children, but to man frontline trenches and care for the sick and the injured. Children displaced by fighting stand in line and wait for handouts in 2010. Janan is Turi — a tribe of 500,000 whose adherence to Shi’ite Islam makes it unique among Pashtuns. The Turis occupy a sliver of tribal territory known as the Parrot’s Beak that extends westward across Afghanistan’s eastern border. On the Pakistani side, Parachinar is positioned within striking distance of Kabul, which is just 100 kilometers to its east. For the most part, the Turis lived in harmony with neighboring Sunni tribes for centuries, with a handful of exceptions. In the 1980s, predominantly Sunni Afghan Islamist guerillas attempted to overrun the strategically important region. In 2007, a fierce sectarian war broke out when the Sunni Taliban attempted to conquer the Parachinar. More than 3,000 people have died and thousands more injured in the ensuing fighting. Some Sunnis blame Iran for the development, claiming the clerical regime supported and radicalized their Shi’a neighbors. Animosity remains high, but a cease-fire worked out in early February and backed by Islamabad offers proof that Shi’a and Sunni alike are committed to peace. 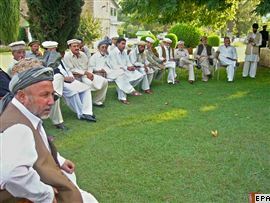 Tribal elders and government representatives attend a peace conference in Parachinar in 2008. A peace agreement was signed before, in 2008, but it lacked government support and rival factions had one eye on possible military gains. Under the new agreement, Islamabad is promising rehabilitation for the thousands of displaced families, and the deployment of additional troops to guard key routes. Skeptics abound. Pakistani pundits suggested that the deal was worked out by the Haqqanis — a large Pashtun family from Afghanistan whose elderly patriarch Jalaluddin Haqqani emerged as one of the most effective guerilla commanders in the 1980s. His son, Sirajuddin Haqqani, now controls thousands of fighters and facilitates relations between Al-Qaeda Arabs, extremist Afghans, Pakistanis, and Central Asians out of his sanctuary in North Waziristan, which adjoins Kurram to the south. Considering the Haqqanis anti-Shi’ite bent and outsider status, any role in an agreement would be rejected by Kurram’s Shi’a. Turi said that the weakened position of the Taliban, in disarray after years of military operations, opened the door to peace. He said that even local Sunni allies of the Taliban now see the futility of their military campaign. Key intermediaries have high hopes for sustainable peace in Kurram. Waris Khan Afridi, a respected tribal leader from the neighboring Khyber tribal district, was among the mediators who put in countless hours bringing the two sides together. On February 5, Afridi led the first civilian convoy of hundreds of vehicles to mark the break of Parachinar’s siege. He described an unforgettable scene of thousands of Sunni and Shi’ite villagers welcoming his entourage. “It was like they all were freed from prison that day,” he said. Now, Afridi said, Pashtun tribes in neighboring tribal valleys are poised to follow the Kurram example. “We have always said that force is not a solution for anything and that the military operations will not solve our problems,” he said. With the devastating floods that began in July, Mother Nature has left an indelible imprint on Pakistan—its geography, its people, its national psyche. But it has also created an opportunity to change the destiny of millions of flood victims who traumatically lost their loved ones, homes, and livelihoods in mere days. This natural disaster may have given the country an opportunity to tackle a recurring point of contention in Pakistan—feudalism. Academics, journalists, and analysts have frequently pointed to feudalism as a reason for the huge inequalities in Pakistan, claiming that many landlords treat their tenants and peasants like slaves. According to a 2009 estimate by campaigner Anti-Slavery International, debt has forced more than 1.8 million people to work for their landlords with no pay. If there is truth to this today, in even a few cases, perhaps the floods have delivered Pakistan an opportunity to empower those trapped in decades of feudalism and poverty. The question is how to capitalize on this potential opportunity. 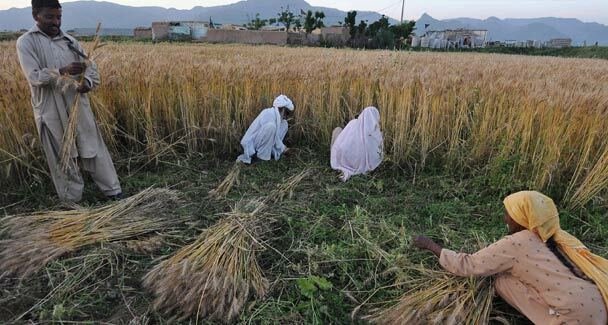 Land reforms in 1959, 1972, and 1977 failed to redistribute land more equitably and are not expected ever to be legitimately carried out by any government, due to political constraints. What is possible today, in a post-flood scenario, is a collaborative effort among the private sector, entrepreneurs, NGOs, and foreign donors to be creative about job creation, even if only on a small scale. If successful, at least some of these landless flood victims could be given an opportunity to rebuild their lives outside the feudal context. As many flood victims return to their homes to figure out how to rehabilitate their lives, others have already declared they will never go back. They appear to feel the floods have given them an opportunity to break away from the hold of their landlords. They did not own the land they were tilling and had to give large portions of their produce to their landlords while never coming close to paying off their debts. Recent media coverage has captured the anger of many flood victims, particularly in rural Sindh. Some residents of Dari, near Kandhkhot, for instance, reportedly said they were literally left on the side of the road and abandoned by their landlords when the floods began. Unable to find shelter, they took refuge under some trees for a few weeks before making their way to overpopulated relief camps. Others with health problems made their way to camps but were turned away for medical treatment because they were not registered and have yet to be contacted by their landlords. Those who had small plots of land fear they will never retrieve what they owned because all the paperwork has been washed away. There have also been reports of some influential landlords having had floodwaters diverted to save their own lands and instead engulf the villages of the poor. Others have said food rations and other forms of aid given to these landlords have only been passed on to their relatives and voters, while some apparently have kept the aid in storage for their own use in the coming months. While this has been difficult to prove, the perception of such acts has likely added to the resentment of some tenants and peasants toward their landlords that could derail feudal relations in the long term. As flood relief efforts increasingly focus on rehabilitation, we have to consider what these flood victims will do now. If they are not in a position to return to work on the land of their feudal lords, how will they make a living? working five days per week and receiving 400 to 600 Pakistani rupees ($4.7 to $7) for six hours of labor in a UNDP-sponsored project. So while they earn money, these flood victims are rebuilding their homes. But these jobs are short-term and do not cater to those who feel they cannot return home to work for their landlords. It would thus be prudent to think about long-term employment strategies, such as bottom-up programs, specifically for this cadre of flood victims. Perhaps foreign aid and NGO workers could work together with a local microfinance bank to introduce a combination of vocational training and loans for these flood victims so they can create their own employment and gain self-sufficiency. Or maybe social entrepreneurs can ally with the private sector to consider training flood victims for rural outsourcing in a particular area. There should also be a psychological component to any rehabilitation efforts, not only to help the flood-afflicted cope with the ongoing trauma of the floods, but also to introduce them to the idea of economic independence through these job creation projects. This is the time to be creative for those flood victims who are not in a position to go home and work for their landlords anymore. It would be worthwhile for a local university, such as Lahore University of Management Sciences or Karachi’s Institute of Business Administration, to organize a job-creation conference, drawing on the perspectives of local businessmen, entrepreneurs, academics, NGO workers, and the flood victims themselves. These participants could start by “adopting” one flood-afflicted community of landless tenants and peasants, and brainstorming creative strategies specifically for their long-term employment and self-sufficiency. Maha Hosain Aziz is the senior teaching fellow in South Asian Politics at London’s School of Oriental & African Studies.